Update: Welp. The House has cancelled its Tuesday session and will meet again on Wednesday. That means this House will have the record for the most days without a permanent speaker. Today, Day 22 of the legislative session, the House will tie the longest the chamber has gone without electing a permanent speaker. Without a speaker to appoint committees or a Rules Committee chair, the House has been at a standstill for weeks. The 1981 House organized on the 22nd day of its session for it to all be overthrown that summer with the infamous floor mutiny. Thought there’s still negotiations going on in the House, Rep. David Eastman (because of course) pushed for yet another doomed speaker vote on Monday nominating the 20 Republicans’ pick of Rep. Dave Talerico to the position. Talerico’s vote failed 20-20 (as it did back on Day 8), but not before a few of the expected speeches about getting to work and doing the peoples’ business were offered by Republican Reps. Tammie Wilson and Sharon Jackson. Rep. Geran Tarr, D-Anchorage, called the whole thing a stunt that worked against the good-faith negotiations that were still underway. The most important comments, again, came from Rep. Gary Knopp, the Kenai Republican who’s pushing for a large bipartisan majority, who said once again he would not be supporting either the Republicans or the remnants of the Democrat-led House Coalition. The House was going to adjourn until Wednesday, which would have guaranteed the chamber sets the record for going the longest without a majority, but there was an objection brought by Republicans so they’ll adjourned without a return time. The Legislature’s uniform rules requires them to then meet the following day at 10 a.m. Today’s floor session, however, has already been postponed. The Senate Finance Committee got an update on the state’s debt picture on Monday. The state’s overall debt picture is improving with the overall debt owed by the state down to $13.5 billion. The state’s payments on its retirement system debt is, however, expected to rise and the state’s unfunded liability (it’s been a while since we’ve heard that term) makes up about $6.9 billion of the overall debt picture. All told, it doesn’t paint a stellar picture, but a stabilized one after the state’s credit rating went into a freefall in 2016. The debt presenter, according to the ADN report on the hearing, suggested the state could take on somewhere between $200 million and $300 million without breaking the bank. Gov. Michael J. Dunleavy’s PFD repayment bills will be in front of the Senate State Affairs Committee today at 3:30 p.m. It’ll be one to watch as the Senate so far has suggested here and there that it’s not totally on board with the governor’s proposal to restore dividends by draining hundreds of millions of dollars from the Alaska Permanent Fund’s earnings reserve account this year and the following two. The governor’s proposal is particularly interesting given the backdrop of his proposed mid-year cut to education, which illustrates perfectly just how fleeting the Legislature’s future spending obligations can be. It also comes as the Alaska Permanent Fund’s values are down 3.19 percent for the first half of the current fiscal year. 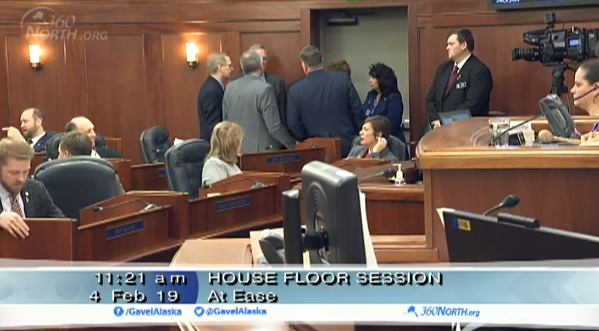 Be the first to comment on "AKLEG Day 21: House ties record for days without a permanent speaker"